After the accidental creation of the Pannovas, scientists wondered if the same methods could be used to engineer other species to benefit mankind. They would not take them to full sapience, but mankind's partners might be more useful to him if they were more intelligent and other animals could be brought under the human yoke of domestication. Many of these efforts were failures. Ravens were simply too alien for methods developed on mammals to work; dolphins may have been made more intelligent but they were not strongly motivated to work with humans and their care was exorbitantly expensive; and elephants simply required too much space and food to begin the breeding project. However, there were several notable successes. One of the first, and most successful, attempts at creating an enhanced animal was with mankind's oldest and most faithful companion – the dog. Wunderhunds*, or wonder dogs, were first created at the Humboldt University of Berlin using the methods pioneered by the Chapter Two project. The methods that worked to create Wunderhunds from dogs were attempted on other mammals. They worked best on the most closely related carnivorans - bears, raccoons, sea lions, skunks, and the weasel family. These animals did not naturally work with humans, however, so additional effort was necessary to introduce dog behavioral traits into them to make them tractable and to have a natural ability to read human gestures and inclination work with people. The bears were a bust – there is absolutely no demand for a half-ton eternally hungry beast with immense strength even if it isn't going to maul you. If nothing else, it is going to cost an arm and a leg in food bills alone, not to mention the damage it would do around the house. And, of course, no one really wanted a highly intelligent skunk. Meanwhile, very small carnivorans, such as ferrets, simply did not have the cranial capacity for advanced intelligence despite their usefulness in getting in to tight places. Modifications to the other lineages had more success. * The proper German plural of Wunderhund is Wunderhunde. But the name has been adopted into English, where it has acquired an English plural. Enhanced animals have a cognitive capacity somewhere around that of a three or four year old Human. They can understand speech, with a vocabulary of around 1000 words, but lack the vocal equipment to say words themselves. Most can count to at least three, many can reach ten, and a few with the natural aptitude can count into the thousands and perform simple arithmetic such as addition and subtraction. They have increased problem solving and reasoning capabilities compared to the base stock, an improved instinct for tool use, and a basic theory of the mind that allows them to understand what others may be thinking. Enhanced animals have episodic memory – the ability to recall past events, places, and feelings that the animal experienced as an autobiographical history; consequently, the animal has more of a sense of self in relation to time allowing it to plan for the future and understand cause and effect. In addition, enhanced animals are equipped with increased self control compared to their base stock. It is very common to surgically implant pickups for an electronic voder, to bypass the animal's natural lack of vocal cords. This allows the animal to speak when wearing a voder (typically attached to a collar or harness). The ability to communicate with Humans significantly improves an enhanced animal's utility, and is less frustrating for the animal as well. In most cases, motivational changes to the base animal were also made. Since useful animals were very often solitary by nature, their emotions were adjusted so that they craved Human attention, interaction, and approval. They tend to bond closely with their caretaker if treated with kindness, and given comfort, consistency, and a sense of belonging and trust. This is, in many ways, not too different from the way non-enhanced dogs naturally behave … or Human children, for that matter. However, because of their increased intelligence, enhanced animals get bored easier and are better able to defeat any safeguards their owners put up to restrict access or limit their options. The best working relationships occur when the animal has a well-defined job to do and its person has the time and dedication to regularly work with it. Lacking this, the animal may become destructive, neurotic, depressed, or may attempt to escape. But if given love, trust, regular attention, and a firm guiding hand an enhanced animal can make a devotedly loyal and fantastic companion. Since successful creation of enhanced animals has occurred mostly with carnivorans (and equids as an outlier), you tend to find many traits in common among them. All are primarily scent-based animals with remarkable senses of smell, and a sense of touch centered around the muzzle rather than the hands (or, for Lontras and Newcoons, both the muzzle and the hands). Their hearing ranges from very good to exceptional, but their eyesight is not up to Human standards. This arises from fundamental trade-offs since carnivoran and equid eyes are adapted for detecting motion and vision in low-light, which they are very good at. The consequence is that their ability to distinguish detail suffers. Practically, this means that enhanced animals cannot read, because they cannot make out the letters – the brainpower is there, but the visual acuity is lacking. Fortunately, they can recognize most common road signs and other navigational aids that do not rely on letters. In addition, all enhanced animals are red-green colorblind. Their vision relies on only two primary colors, which can be described as yellow and blue, with red, orange, and yellow all perceived as yellow and green hues as shades between yellow and blue. The carnivorans tend to be highly motivated by food. Treats make excellent rewards, and feeding them becomes a powerful bonding method. This often develops into a problem – an animal without a strong leader or sufficient self control can take to raiding the garbage or refrigerator. Mechanical exclusion devices rarely work in this case: newcoons can figure out ways to bypass most any contrivance, for example, and a wolverine can just dig through any but the most ridiculously over-built armor protection. Norhorses, being equids, do not have as strong of a food drive, but even they appreciate the occasional carrot, apple, or sugar cube. Increased intelligence and an instinct for tool use does not mean that an enhanced animal necessarily has the dexterity to manipulate complex tools. Most enhanced animals can only crudely use their mouths to grip or their front paws/hooves to clumsily paw at items. Some, however, were modified with tool use and manipulatory abilities in mind - the base stock of Newcoons already had dexterous hands and Lontras incorporated genes from two very close relatives with clever fingers and excellent manual control. Even both of these species, however, lack opposable thumbs, limiting their grip strength. Nonetheless, you should expect any enhanced animal to figure out tricks like using boxes for stools, laying down planks for ramps, lifting latches with their nose, and the like. Enhanced animals were engineered to work with Humans. However, they can easily form bonds with other sapient species as well. This is not always quite as smooth as with Humans – the animals have instincts to understand Human-specific behavior, body language, and facial expressions – but these hurdles are minor and easily overcome. Pannovas, which share a great many traits with Humans, can interact with enhanced animals nearly as well as a Human can. Wunderhunds resemble ordinary dogs, but with the increased intellectual capacity of any enhanced animal. Unlike other enhanced animals, few motivational changes were needed – base dogs already innately bond with humans. Wunderhunds found immediate success with police, border patrol, customs, stockmen, and people with disabilities requiring service animals. Their increased intelligence and ability to understand most Human language made it much easier to train them and gave them an increased flexibility and capability not seen in standard dogs. Verge Collies and Foxdogs: Developed from Border Collie stock with some contributions from German Shepherds and Australian Cattle Dogs, the Verge Collie immediately became popular with stockmen on the newly developed colonies of the Verge. It is a medium-sized hund displaying exceptional agility, usually with a shaggy coat with a white chest, paws, and blaze down the face, a black, blue, red, chocolate, or blotched color elsewhere, a long muzzle, and erect ears. 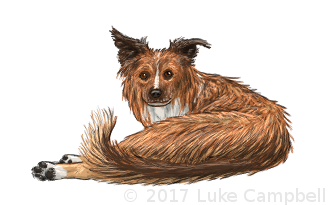 Red-coated Verge Collies are often called Foxdogs, for their resemblance to large foxes. Active and inquisitive, they have a natural instinct for working with large animals. They are common sniffer hunds, being used to locate contraband or track down people or game. For dedicated sportsmen, Verge Collies are popular retrievers, pointers, and trackers. Denali Mastiffs: Denali Mastiffs are large, powerful hunds with robust frames, strong jaws, and a shaggy coat. They were produced using the Humboldt technique on stock from Tibetan Mastiffs and Akitas at University of Alaska Fairbanks. Contrary to some urban legends, they were never designed to pull sleds – you want a much dumber animal for that! Rather, they are excellent guard hunds and police animals whose powerful physique and speed allows them to deal with intruders and fleeing suspects. While enhancing their intelligence, the engineers who produced them also fixed many of the health problems that plague large dogs, leading to a longer, more active life. Mutts: It was inevitable that Wunderhunds would interbreed with normal dogs. The resulting offspring share a mix of traits of their parents – not as smart as the hund but smarter than the dog. Mixed breed animals like this were often were in high demand, since they often made better pets than pure breed hunds. Several distinct breeds were developed from these mixed bloodline animals. Meanwhile, feral and village dogs tended to gain some hund genes over time. Mixes between two Wunderhund lines remain full Wunderhunds, although the offspring carry mixtures of the physical traits of their ancestral breeds. One of the more common new animals is the Lontra. Modified from the Canadian river otter, Lontras are used where a semi-aquatic working animal is useful such as retrieving waterfowl or underwater search and rescue. Lontras display the typical attitude of the weasel family – eternally playful, active, fearless, belligerent, fun-loving, curious, and full of attitude. Their genetic behavioral design makes them willing and able to work closely with Humans, desire Human approval, and follow Human commands. Despite this, there are challenges. In a house, a Lontra will get into anything and everything just to see what is there and how it works. They have a fascination with water, and will quickly learn how to turn on faucets. It is therefore fortunate that they are smart enough to be taught to turn the faucet off again and not to let the water overflow when they make themselves a bath, and to (usually) put things back where they found them. Nonetheless, Lontras work exceptionally well for their designed roles, which could range from laying underwater cables, checking docks or dams for emerging structural defects, assisting boaters in distress, rescuing drowning swimmers, or just retrieving shot waterfowl. In addition, Lontras were modified from their original stock to have more dextrous hands, using genes from the Aonix and Amblonyx otter genera. This, coupled with their smallish size and remarkable flexibility, made Lontras useful for work in confined areas requiring dextrous manipulation, such as dragging cables down pipes, assisting with repair work in tight quarters, and inspections in places where Humans could not go. 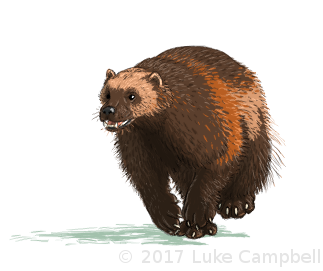 Wolverines are not the first animal you might think of that would be useful to enhance with extra intelligence, since these giant snow weasels are renowned for their toughness, stubbornness, independence, and ferocity. Like their cousin in the weasel family, the Lontra, wolverines display remarkable tenacity, curiosity, fearlessness, activity, and playfulness. The Wunderine project developed enhanced wolverines primarily for avalanche search and rescue, where their incredible sense of smell and ability to easily walk over snow was invaluable – the wunderine would scour the avalanche site, sniffing for victims, and would then help dig out the survivors and bodies. Since then, their amazing endurance, strength, and inability to know when to quit has opened up many other working animal roles for them. Fortunately for those who work with them, the pungency of the Wunderine's musk glands have been toned down to more acceptable levels by the engineers who made them. A modified Raccoon, Newcoons are used where you need a pair of dextrous hands to work in places that a Human has trouble reaching such as confined spaces or up tall structures. Newcoons also gained popularity as charming pets, since they never developed the aggressive and independent attitude that the original raccoons do when they mature. Although clever, Newcoons are not overly destructive indoors (although they do get into things, and quickly learn how to raid the refrigerator). Newcoons are omnivores with a broad diet, from grain, nuts, fruit, and vegetables to all manner of meats and small animals. They are skilled climbers, and prefer to sleep in dens made from an elevated cavity. The hands of a Newcoon are remarkably sensitive, and they can work with their nimble fingers using touch alone. 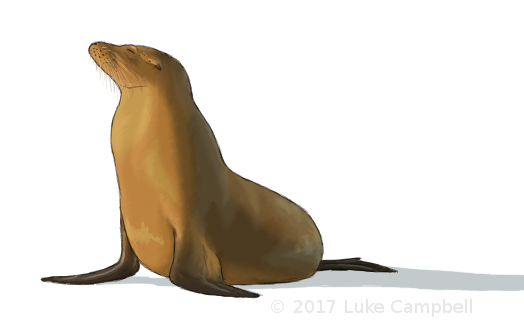 An intelligent and cooperative sea lion was immediately identified as a useful animal to have to assist people with aquatic operations. These enhanced sea lions were called Seawolves. They found immediate use in aquaculture, coast guard search and rescue, military naval mine clearing and underwater sentry duties, laying underwater cables, and even underwater archaeology. Seawolves are quite large animals and rather expensive to keep, so they were never widely distributed despite their usefulness in their specialized areas – but where they were useful, they were quickly adopted. Seawolves have senses tuned to work underwater at the expense of acuity on land. Their underwater hearing is acute, while in the air it is dulled so it is not quite as good as that of a Human. Their vision while out of water is rather fuzzy and does not work well in the dark, while underwater their sight sharpens up and gives excellent night vision. Their sense of touch, via their vibrissae (whiskers) is exceptional. They use their whiskers to forage in the water not only by direct touch but to pick up pressure waves from nearby swimming prey. Since smell is of little use to an underwater predator, their olfactory abilities are not particularly well developed. Seawolves can hold their breath for over 1.2 kiloseconds (20 minutes), and regularly dive to depths of 200 meters. They are lithe and agile underwater, "flying" with strokes of their wing-like front flippers. On land, they are far less nimble but can scoot around on all fours. Developed from quarter horse and appaloosa stock, the Norhorse was designed as a working horse that could better understand Human commands while cooperating closely with Humans for jobs where cleverness and initiative was needed. This was a difficult project, because new techniques needed to be developed for enhancing perissodactyls when what worked on primates and carnivorans failed to be applicable for horses. In the end, however, the research project was successful and Norhorses were made available. They are commonly found as working farm horses, especially for working cattle, and for mounted police work. Norhorses prefer to live in small herds. Mares live in family groups with their immature offspring and one stallion, and are led by the oldest and most experienced mare. The stallion is replaced when he can no longer fight off rivals. Stallions that don't have a harem live in bachelor herds with other stallions. Norhorses are skittish and prone to startle (although no more so than unaugmented horses). Unfamillar objects or events are likely to cause a Norhorse to spook. They will more readily accept the odd or unusual if their leader or rider shows no fear . Any sign of their leader balking, however, is likely to send it running for safety. Norhorses are grazers. They eat primarily grass. Since grass has a low nutrient value, Norhorses spend most of their day eating. They prefer to stand in the open; with their heads down for grazing, they can see nearly 360 degrees around them and remain alert for danger. The popularity of enhanced beasts as working animals in the Verge has resulted in the occasional escape, which in turn has led to feral populations of these animals on many worlds. Feral enhanced animals can be problematic because they are so clever – its bad enough when a wolverine keeps raiding your garbage can and killing your lambs, but when that wolverine is exceptionally crafty it becomes quite a challenge to deal with. Occasionally, people return from wilderness areas with remarkable stories about being rescued or otherwise assisted by feral enhanced animals. Often, the fortunate person returns with their new-found friend who helped them. It seems that the instinctive traits that allow them to work with humans continue to operate when the animal is raised in the wild among its own kind. This trait should in no way be relied upon, however – plenty of people have been killed by roving feral packs of Wunderhunds, for example. Enhanced animals animals are not considered full people under the law. They do not have the legal guarantee of sapient rights granted to Humans, Pannovas, Laer, Gummis, Tweechis, Pirangs, and Mants. However, within the Verge Republic, they are protected from unnecessary cruelty and arbitrary killing, and guaranteed a legal right to humane care. An owner of an enhanced animal must provide it with adequate food and housing, and an environment suitable to meet its psychological needs. Because enhanced animals are generally loyal to their owners and smart enough to return home and not cause too much trouble, they are often allowed to roam freely and leash laws and the like rarely apply to them.